What is Tricompartmental Knee Replacement? 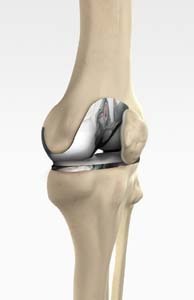 Tricompartmental knee replacement surgery is commonly indicated for severe osteoarthritis of the knee. Osteoarthritis is the most common form of knee arthritis in which the joint cartilage gradually wears away. It often affects older people. In a normal joint, articular cartilage allows for smooth movement within the joint, whereas in an arthritic knee the cartilage itself becomes thinner or completely absent. In addition, the bones become thicker around the edges of the joint and may form bony "spurs". These factors can cause pain and restricted range of motion in the joint. The goal of tricompartmental knee replacement surgery is to relieve pain and restore the alignment and function of your knee. Your doctor may recommend surgery if non-surgical treatment options have failed to relieve the symptoms. The surgery is performed under spinal or general anesthesia. Your surgeon will make an incision in the skin over the affected knee to expose the knee joint. Then the damaged portions of the femur bone are cut at appropriate angles using specialized jigs. The femoral component is attached to the end of the femur with or without bone cement. The surgeon then cuts or shaves the damaged area of the tibia (shinbone) and the cartilage. This removes the deformed part of the bone and any bony growths, as well as creates a smooth surface on which the implants can be attached. Next, the tibial component is secured to the end of the bone with bone cement or screws. Your surgeon will place a plastic piece called an articular surface between the implants to provide a smooth gliding surface for movement. This plastic insert will support the body's weight and allow the femur to move over the tibia, like the original meniscus cartilage. The femur and the tibia with the new components are then put together to form the new knee joint. To make sure the patella (knee cap) glides smoothly over the new artificial knee, its rear surface is also prepared to receive a plastic component. With all the new components in place, the knee joint is tested through its range of motion. The entire joint is then irrigated and cleaned with a sterile solution. The incision is carefully closed, drains are inserted, and a sterile dressing is placed over the incision. Rehabilitation begins immediately following the surgery. A physical therapist will teach you specific exercises to strengthen your leg and restore knee movement. Knee immobilizers are used to stabilize the knee. You will be able to walk with crutches or a walker. A continuous passive motion (CPM) machine can be used to move the knee joint. Continuous passive motion is a device attached to the treated leg which constantly moves the joint through a controlled range of motion, while the patient relaxes. Your physical therapist will also provide you with a home exercise program to strengthen thigh and calf muscles.